Synology has announce the availability of it's latest 4-bay NAS, the DS415+! Running on a Quad-Core Intel Atom CPU, there is plenty of horsepower under the hood for almost anything you could possibly want to run on it. If you are also into streaming your media all over the place, then you'll be happy to know that the DS415+ supports "Group 1" video transcoding. That means, depending on your device, you'll get either original video OR remuxed video up to 720p! Doesn't mean much on Android, but on IOS or Windows Phone, you are no longer limited to what videos you can or can't stream! 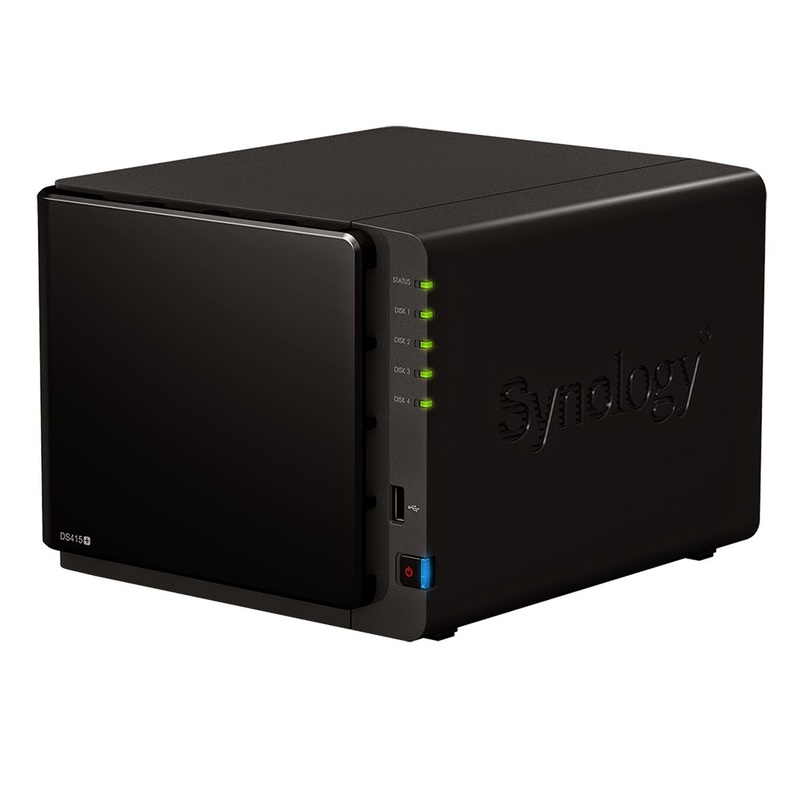 Bellevue, Washington – September 15, 2014 – Synology America Corp. released the greatly anticipated DS415+, a faster and more secure network attached storage successor to the DS412+. The DS415+, powered by the award-winning OS DiskStation Manager, is well-suited for small and medium-sized business users who care about high performance throughput and safety for data sharing and backup. “Thanks to its best-in-class combination of hardware specs and DSM software integration, DS415+ handles data transfer and encryption at blazing fast speeds, businesses and individuals can safeguard their data while maintaining excellent performance,” said Michael Wang, product manager at Synology Inc. The new quad-core 4-bay box is a full-featured NAS solution to centralize data backup, protect critical assets, and share files across different platforms. The DS415+ NAS solution has Quad Core CPU with an AES-NI hardware encryption engine, a floating-point unit, as well as 2GB DDR3 RAM. The four drive bays accommodate huge amounts of storage capacity, while the USB 3.0, USB 2.0, and eSATA ports allow users to connect and access a range of external storage devices. Dual LAN ports support failover and link aggregation, thus improving resiliency and potential throughput. · DS415+ delivers an average 228.04 MB/sec reading and 233.51 MB/sec writing speed under RAID 5 configuration in a Windows® environment. Its predecessor, the DS412+, under the same conditions delivers an average 158.33 MB/sec writing speed. DS415+ supports Synology High Availability (SHA), harnessing an active and a passive server into one cluster, mirroring written data between the two units. Should the main server malfunction, the passive server immediately kicks in and takes over all running services and data. Synology Hybrid RAID allows you to optimize usage and get the most out of your hard drives, while also keeping your storage safe with data redundancy. Complete backup solutions including LUN Snapshot, LUN clone and Backup & Replication minimize the impact of disasters. DS415+ operates DiskStation Manager (DSM) 5.0, an intuitive web-based operating system that provides a host of applications to bring better productivity to work environments and offers a new level of multimedia experience. Synology was voted as “PCMag Business Choice Award 2013 winner” and received the highest rating in every element of the survey, including reliability, overall satisfaction, value, and likelihood to recommend for Small Business Storage. The DS415+ is shipping now, and will be available in the United States September 23rd. Please visit https://www.synology.com/en-global/products/DS415+ for further details. Synology develops Network Attached Storage and IP surveillance solutions that transform the way users manage data and conduct surveillance in the cloud era. By taking full advantage of the latest technologies, Synology aims to help users centralize data storage and backup, share files on-the-go, and implement professional surveillance solutions in reliable and affordable ways. Synology is committed to delivering products with forward-thinking features and the best in class customer services.